Landing pages generally require a unique design drupal templates that varies drastically from traditional page models. In this case, using the Drupal panelizer mode, available in Drupal 6 and later, to design your landing page is the best possible option and gives you a wide range of possibilities. The creatiz themes are trendy and beautiful as they involve a light sophisticated background, thus the main content on the page is highlighted. The creative stunning designs are used to create business portfolios, company profiles or for blogging and personal use. The retina ready images are used while designing any page so that a clear image attracts the focus of the users and generate uniqueness. Customization is allowed to create your personalized theme and decorate it with your name in the background or your company’s logo flashing up on each click. The landing pages are created by using lots of colors which is the entry point for any website. The elements used for designing any company’s website landing page can be easily modified as per the choice of the client. The websites often upload success stories or promotional content for any firm with the help of a video which can be well displayed on these landing pages by embedding the video with Youtube links. The theme page shows Google maps attached with the page which also highlights the company’s office locations and all branches are marked. An event planning requires a lot of things to manage while designing or creating an event for the company. This event theme is perfect to finalize the venue, theme for the event, speakers and sponsors. 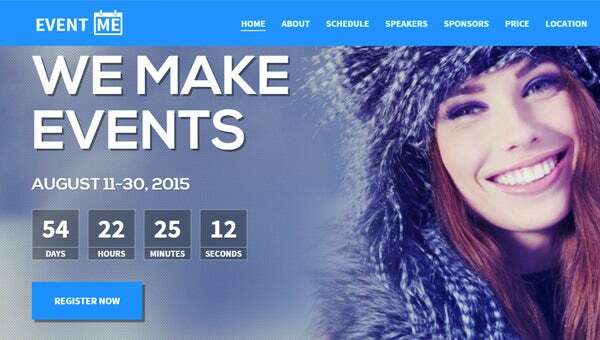 The theme page is attractive and is retina ready which displays the main image related to the event. The date and venue of the event will also be highlighted in the theme. The registration form is available at one click and online fee depositions options are also available on the front page with help of proper navigation through clicks. A chat group is also created on the event page which clears all the queries related to the event and the promotional videos can be shared through social media links created at the bottom of the page. Details about the speakers are mentioned on the theme with a brief summary of the speaker. The biz review theme is designed to promote upcoming business. This search page is designed for users to search for nearest and renowned business for getting their work done. The nearest restaurants, ice shops, coffee shops, eating points or fashion outlets are pointed on the theme page with a review posted by the users and a brief summary of the company profile on the links. A rating card is also shown on the theme page. Although you may not understand the coding itself, the basic Panels option will make it easier for you to select a Top Drupal template and then add custom features according to your need. Panelizer can bring in content parts from different sources on your site and can be very useful when you’re referencing different content types, views and blocks. It can then assemble all these in a cohesive manner on your landing page. You can use your panelizer to override basic page templates and then add custom data, files and enable feeds, comments and other public features. A number of custom views are possible and content creators can choose from a number of these to create the page view that they require. Using the context keywords you can path-alias your URL, and this leads to better Search Engine Optimization (SEO), which in turn leads to better searches for materials on your website. This makes the content of your landing page more dynamic. The key to success is to embed web forms into your landing page itself, and this makes for a seamless cohesion on the page.If the landing page is attractive and easy-to-use, then your Top Drupal website will always attract more visitors and clients. These templates and themes are designed for promoting business, companies or marking a new business on the Google maps. Any event or business can be endorsed supported by help of these theme pages.